Bats and Spiders. Probably those are the first things that comes to mind when we encounter the word ‘cave’. Can’t blame you though, I had that in mind too when I was informed by the rock climbing group about a trip to Sirih Cave on Serian which had a climbing wall with some climbs to try. So having packed up the basic rock climbing gear we set out towards Serian early in the morning. 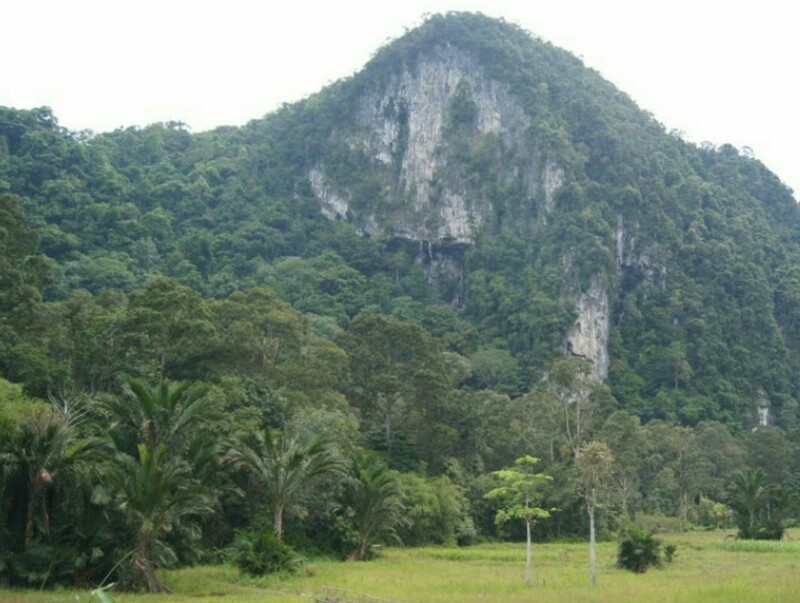 The limestone hill where Sirih cave is located. View from the football field of Kampung Bantang. Located approximately 50 kilometres from Kuching the drive there will take about 1 hour, less probably. It took us about two hours as we stopped by for some local breakfast so, that itself took an hour. Coffee done and we were off to the cave entrance. From the village, walking to the cave entrance it took us about 30 minutes. That’s just my estimate. I should remember to time these walks next time. Noh @mohamadnoh and #melanauclimber leading the way up the staircase towards Sirih Cave. Nice warm up climb. There is a nice climb to the cave entrance. Somehow not maintained, we had to go up carefully. Steps were a bit run down and with plenty of moss. As it had rained earlier, it didn’t quite help. So we slowly went up. Making sure each foot had a firm hold before making each step up. Probably if there is enough visitors traffic to the caves, then it would be worth while to maintain. At the moment there’s just drive and drabs of visitors here. 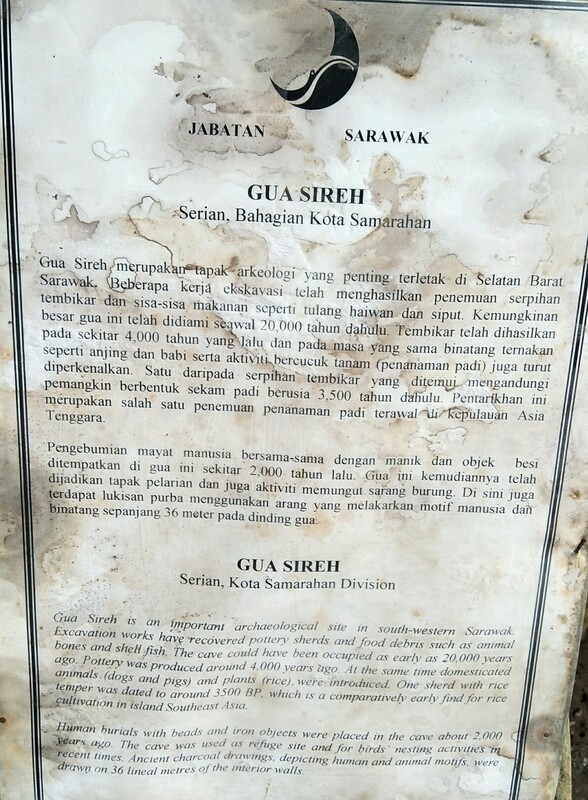 A plaque by Sarawak Museum about the archaeological findings at the cave entrance. First excavated in 1959 by Tom Harrison and Solheim. As we reached the top we came upon a site which was cordoned off from visitors. It was this ancient burial site of the bidayuh community. I couldn’t believe my eyes when I read that some are about 2,000 years old. Wow! Looking at the site from the fence it’s tempting to jump the fence and have a closer look at the cave paintings. Each painting describes who is who buried there. Luckily my phone was able to zoom in and take a photo of one painting. Amelia @amee_rose_gostine gives us a peace sign at the fenced up site. 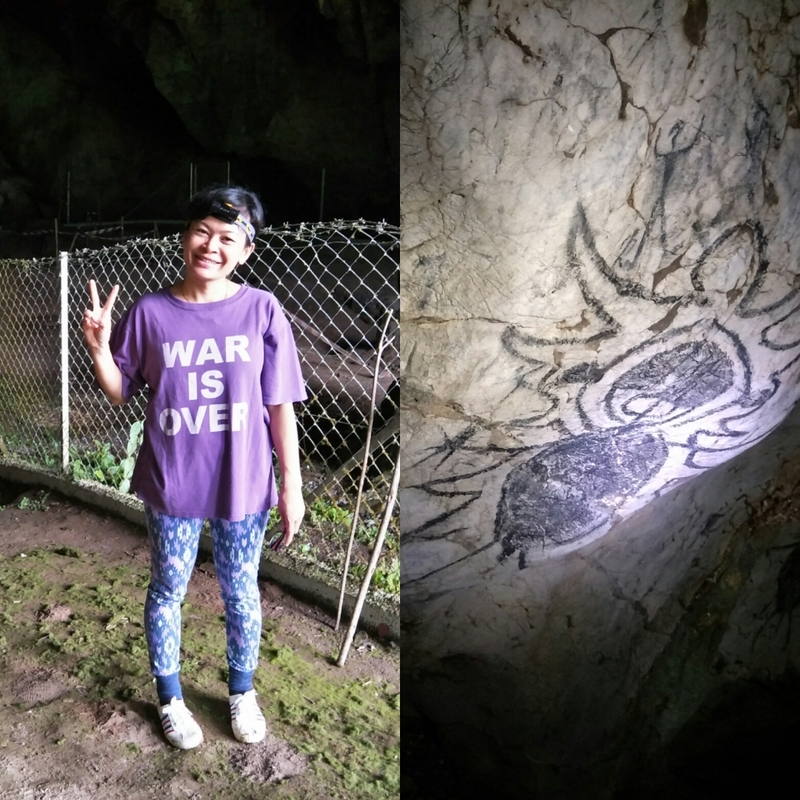 Photo on the right is one of the many cave paintings at this ancient burial site. We were informed that to go have a closer look at the cave paintings, we would need to get permission from the Museum Department as they are the ones holding the keys. Fair enough I guess. Probably more excavation works are planned by them so they rather have this site sealed off for the time being. Lovely view from the cave entrance. Very green. So we proceeded with our caving adventure into Sirih cave. Headlights are handy apparently I discovered. So lucky the guys had theirs on and was able to light my walking paths. I forgot about darkness in caves. Lesson learnt. We took our time looking out for things in the cave and before long enough we saw spiders. Black ones, brown ones, big ones and also small ones. I assumed they were harmless and non poisonous. But we all agreed that we wouldn’t take the chance of touching one to find out if it is poisonous or not. 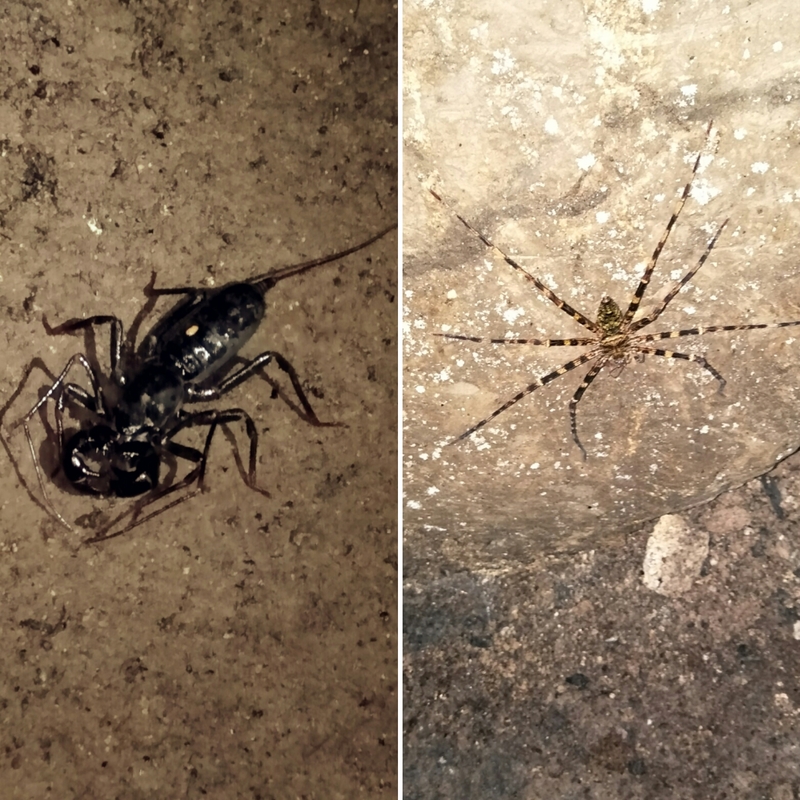 Small scorpion on the left and on the right is one of the many creepy crawlies that lurk the cave. We also found plenty of used bamboo inside and it was evident that the bamboo is used by the cave owners for their birds nest harvesting. The cave owners are the people of kampung Bantang themselves and they have plotted the cave into lots and each lot belongs to a certain family. About 15 minutes into the cave we heard the sounds of rushing water and later on discovered that this cave has a small stream running through it. That explains the smooth walls of the cave in most parts. The cave is carved out by the subtle forces of water. Empty your mind, be formless. Shapeless like water. If you put water into a cup, it becomes the cup. You put water into a bottle it becomes the bottle.. Be like water my friend. It’s a good thing we had our local trekking shoes on, the famous ‘adidas paya’ we call them. Light weight rubber shoes which is perfect to walk in streams with. The water was very cool and it was a welcoming feeling. Somewhere midway we had to maneuver a narrow passageway. This was interesting and in my opinion was the fun part as you had to get down and dirty. Wouldn’t be an adventure caving if you’d be clean spotless. The narrow passage was nice too as it had a slight gush of cool breeze flowing through it. This gives an indication that there is obviously an opening at the end of this cave system. 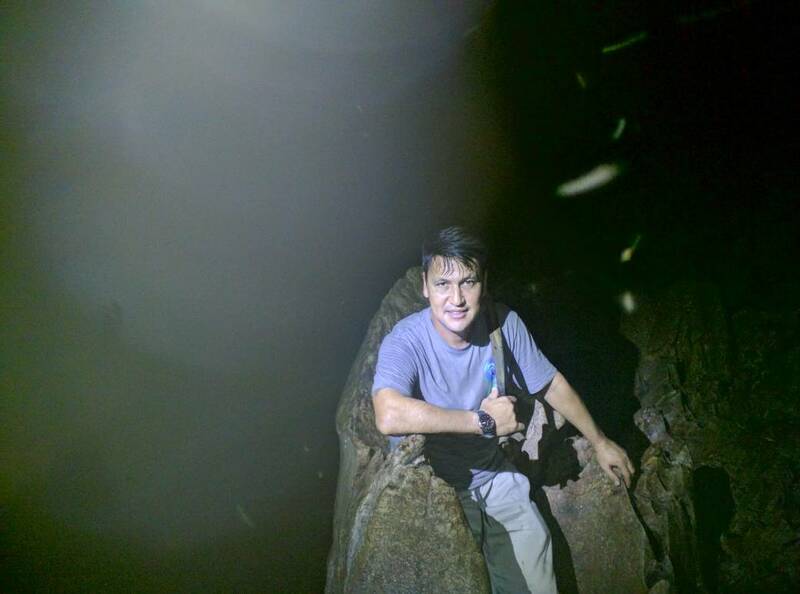 Me posing with one of the stalagmite formation inside the cave. Locals call this the Puteri Belacan. Huge isn’t it just? There’s plenty of stalactite and stalagmite formations in the cave. We took turns figuring out what the formations look like. Poised cobra, jelly fish and crouching tiger to name a few. The best was probably a formation that looked like a throne. We took turns taking photos at the throne with our imagination running wild on which kingdom we ruled in the Game of Thrones series. The throne formation and I decided that I am from house Targaryen. After about 1 hour into our cave exploration we couldn’t go further as there was a larger stream. Without the proper caving equipment and safety gear, it’s wise we turn back at that point. I couldn’t help wonder what it’s like as I know for a fact that there is an exit somewhere at the end and from there an extra hour and a half you’d reach the next village, kampung Kakeng. So we turned back and made our way back. We got back out and we washed ourselves up at a small stream. Washing of the dirt from our shoes, legs and hands. Made our way back to the village and headed off to a potential rock climbing wall nearby. There’s plenty of potential climbs here. That’s a different story and will save it for next time. So we headed up to Serian for our lunch. In conclusion, I enjoyed this half day cave adventure. In terms of difficulty, on scale of 1 to 10 with 10 being the most difficult, I would give this a 5. Kids aged 10 years to adults aged 65 years would be able to do it. 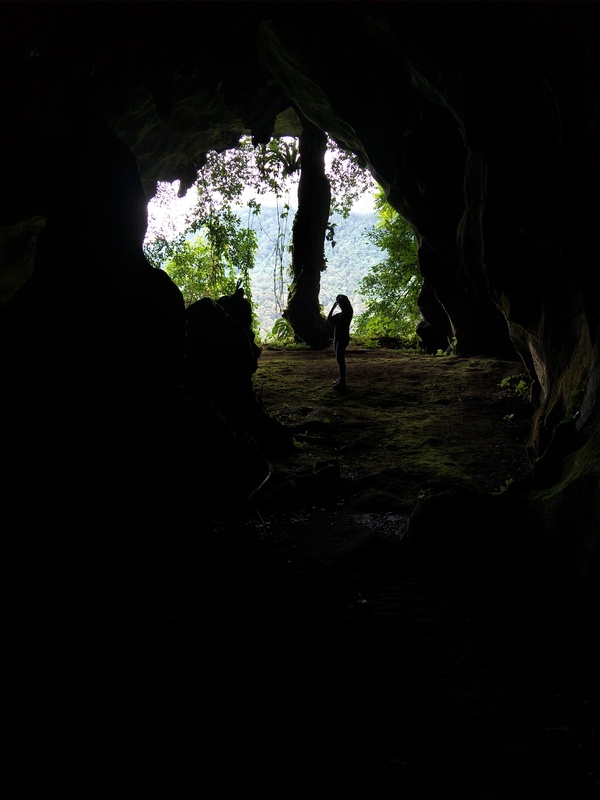 So if you are looking for an interesting caving adventure not far from Kuching, Sirih cave is highly recommended. It’s very accessible and you could make it a full day tour by combining it with a tour of Serian market or with Semenggoh Orangutan Rehabilitation Centre. Tours can be arranged with most local tour operators or with the village folks directly. If you are a rock climber and want to do climbs as well as cave exploration, best look for Noh. He is on Instagram as @gorestguesthouse or @mohamadnoh . He has the climbing gear needed. If not you may contact me. LOL why puteri belacan?! That’s such an odd name but this is so cool. Love finding out about lesser known places! I have actually been here and climbed in here when I was small. It was really something. Time for a revisit babeh..